"You may think automatic white balance is good enough. But if you've ever had to fix dozens (or even 100s) of photos with just slightly different colors, one-by-one, you know the true meaning of pain. Best of all, unlike a gray card, the White Balance Cap takes no extra room in your gear bag. Just replace your existing lens cap with this one and you'll always be able to white balance with no additional equipment. 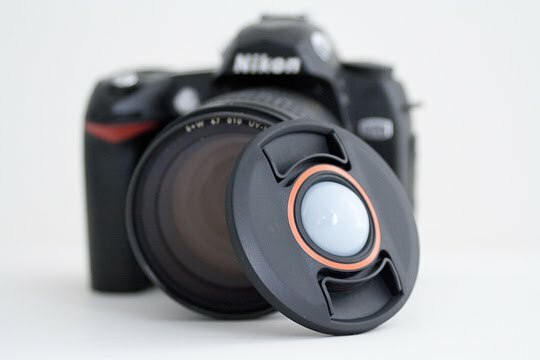 Squeeze the White Balance Lens Cap's side tabs for easy attachment or removal, even with a lens hood in place. The center pinch-release mechanism prevents it from accidentally being bumped off, while in your bag or shooting in a crowd. Note: You may look a little silly setting your white balance by taking a photo with your lens cap still on, but the results are worth it." I ordered mine and you should too.